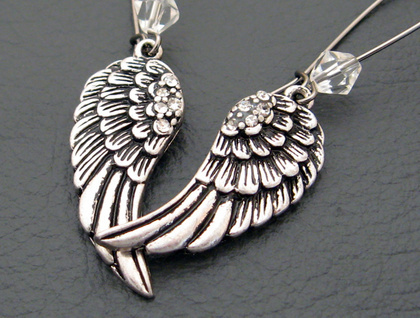 Beautifully detailed, antiqued-silver coloured angel wing charms are the stars of these earrings. The wings have highly detailed feathering, and at the shoulder of each wing are five tiny, clear rhinestones. 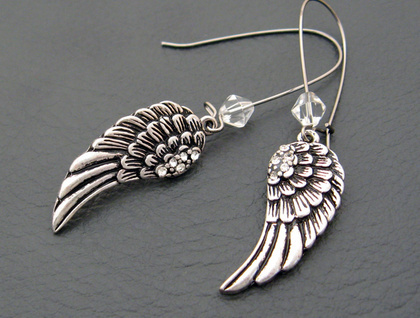 The wings hang from elegantly arched, gunmetal-black ear-wires. 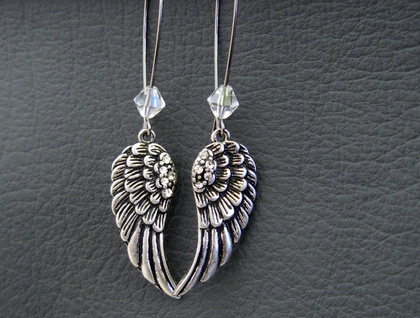 Above each wing, threaded onto the ear-wire, is a clear crystal bead, which perfectly complements the rhinestones on the wings. These earrings sparkle superbly in bright light. The earrings measure 65mm from top to bottom. 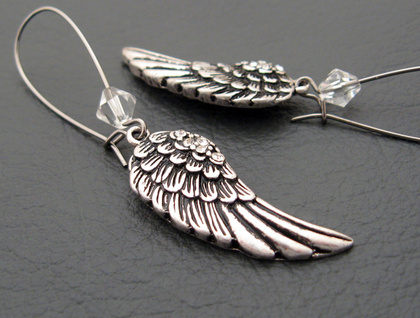 The wing charms are 33mm long, including the baile (hanging loop), and 13mm across at their widest point. They are more lightweight than they may appear.